Italy's State Police will soon be tearing through the country's highways in a brand new Lamborghini. 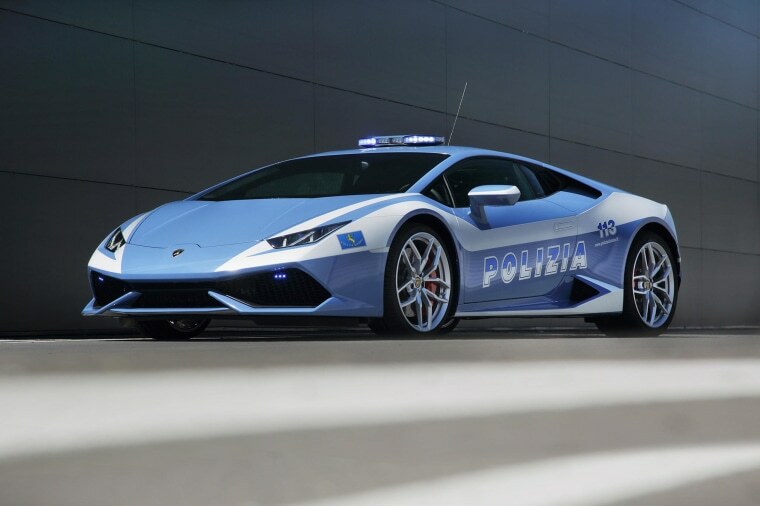 The Huracán LP 610-4 Polizia -- the civilian model of which would fetch a forecourt price-tag of about $300,000 -- will begin service by the end of this year and "sustain security on Italian roads by continuing accident and crime prevention." Painted in "blue Polizia" with white stripes and lettering, the luxury supercar it has its own police uniform. The flashing blue light has been "aerodynamically optimized" for traveling at high speeds and its 5.2 I V10 engine with 610 hp means it can reach speeds of over 202 mph. Non-conventional gadgets include its "Proof Video Data System" which can determine the speed of the vehicle being pursued and transfer its image to the police station. But it is also fitted with more traditional police gadgets such as gun holsters and radio equipment. The sports car was presented to the head of the Italian police by the car maker's president and CEO, Stephan Winkelmann, at a ceremony in Rome last week. The country's police forces have long used the Volkswagen-owned Italian automaker's sports cars. "In the last 10 years, the Italian State Police used the car for prevention purposes and in order to enhance street security" said the Head of the Italian State Police, Prefect Alessandro Pansa in a statement. The Huracán LP 610-4 Polizia will replace the Lamborghini Gallardo which had been donated to the Italian Police Force in 2008. The Gallardo has clocked up 110,000 kilometers in the five years from 2009, on patrol duty across central and southern Italy's motorways, and on emergency medical transport detail.